Why isn’t the Pierce Transit issue on my ballot? In May, the communities of BonneyLake, Buckley, DuPont, Orting, Sumner and large portions of unincorporated Pierce County were removed from the Pierce Transit taxing district/service area. The Pierce Transit boundary and voting district was reduced by the Public Transportation Improvement Conference. If this measure passes, the sales tax will only be collected inside the voting boundary. 105,450 voters were removed from the district. I’ve moved from another county, but never changed my address. Where can I vote? The best thing to do is vote at a voting center in the county where you are registered. Voters can vote a provisional ballot at any voting center in the state. We’ll count the issues a voter is eligible to vote on. Put their ballot in one of 27 secure drop boxes located around the county. Drop box and VotingCenter locations can be found at www.piercecountyelections.org. Visit one of our six Voting Centers where they can get special assistance, such as a replacement ballot if they lost their ballot. Put a stamp on it and mail it. But, we don’t advise mailing today. Ballots must be postmarked by Nov. 6. A special note of caution: the Post Office is not extending its hours the way it does on Tax Day, so advise voters to use a drop box or a voting center. Yesterday, 413 staff supported the election process. Today, we’ve deployed 498 staff to support Election Day. We’ll run two shifts today through Friday, 6 a.m. through 12 a.m.
We will work weekends and Veterans Day. Voters in two Pierce County precincts were issued misprinted ballots with the incorrect congressional district. Voters were called and sent a corrected ballot immediately after the mistake was identified. Voters who sent only the incorrect ballot were called on Saturday, Nov. 3 and reminded to return their correct ballot by the deadline. This turnout is consistent with past turnout in this area. I’ve heard that voters in King County are concerned about party representatives collecting ballots for voters. Is this happening in Pierce County? We haven’t heard reports of this happening here. 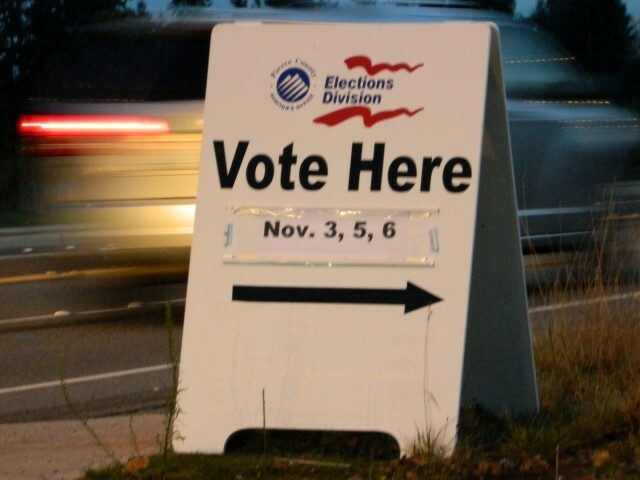 We’ve provided 27 ballot drop boxes and 6 voting centers located across Pierce County. We urge voters to use one of these options for returning their ballot today. The deadline is 8 p.m.
Are you on track to meet expected turnout? Yes. Our returns are strong. We expect to hit 80% turnout. Are there any tight races? We won’t speculate on the results of any race. You’ll know more tonight when we release the first round of results at 8:15 p.m.
How many ballots do you expect to release tonight? We expect to release results for 175,000 voters tonight. Are you on track to meet that goal? Yes. On Monday, we scanned 85,000 ballots. We’ll exceed that number today. When will you release additional results? Nov. 7 – 9: daily at 5 p.m. and 10 p.m.
Nov. 10 – 21: daily at 5 p.m. When will you have the vast majority of your ballots tabulated and results reported? We expect to have 90% of the results reported by Friday, Nov. 9. By Monday, Nov. 12, we expect to reach 95% counted. Is this your first vote-by-mail election? No. We haven’t had a polling place open since November, 2010. In the 2008 Presidential Election, 87% of our voters returned a mail ballot. Only 13% of our voters voted at a polling place. Photo by Josh Magill, and used with his kind permission. Which voting center? The one at PC Maintenance?